All hockey, all the time. Wow this is a very deep draft class! 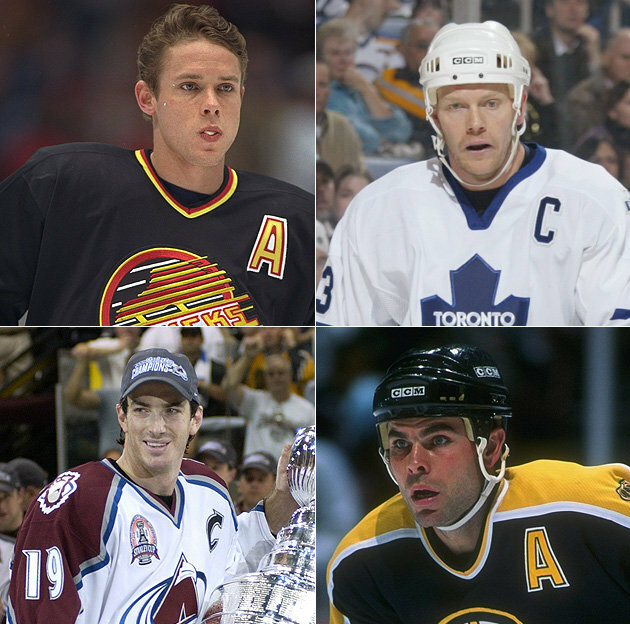 Everyone of the four players elected to the Hall of Fame had fantastic careers that perfectly define what the Hockey Hall of Fame is all about. All four had a positive impact on the game with their excellence, leadership, influence and consistency. Joe Sakic is a personal favourite of mine. The product of Burnaby BC is a proven winner, captaining the Avalanche to 2 Stanley Cups. He has also proven himself on the world stage taking a gold medal home from the 2002 Salt Lake City Olympics. It is said that he may have one of the most lethal wrist shots in NHL history and his 625 career goals would attest to that. “Burnaby Joe” is easily one of the best captains in NHL history and I am extremely happy for him. Mats Sundin definately deserves this. He is the last Leafs captain to captain a team to the playoffs in 2004 and he was the first European to be taken first overall in a draft ever when the Nordiques took him in the 1989 draft. People have questioned his induction because of his failure to capture a Stanley Cup but if you look at his resume you will see he has led Sweden to three World Championships and an Olympic gold medal in the 2006 Turin Olympics. Sundin is a class act, true captain and a winner and being a Leafs fan I am ecstatic to see another Leaf in the Hall. Although the critcs have doubted Sundin, I am more skeptical of the inductions of Oates and Bure. Don’t get me wrong both belong in the Hall. Oates is one of the best passing forwards of the 90’s racking up 1079 assists over a 22 season career where he wore the uniform of seven different teams. He was just named the new head coach for Washington Tuesday also. Great day for Oates. Bure was one of the first of a wave of Russian snipers to break into the NHL and really put Vancouver on the map with his unreal scoring touch. Injuries shortened his career to 702 games but he stil managed 437 goals with five 50+ goals two of them he topped 60. A longer career would put him in the discussion of best scorers ever with The Rocket, The Jet and Super Mario. In a ballot that included Brendan Shanahan and the late Pat Burns I was surpried to see that both Oates and Bure made it. Shanahan is a proven winner with three Stanley Cup rings and an Olympic gold medal in the storied 2002 Salt Lake City Olympics. Didn’t quite put up the same numbers as Oates and wasn’t the pure scorer Bure was, but has a better playoff and international track record than both combined. When Pat Burns lost bis battle with cancer in earl 2010, the NHL lost one of the best coaches of all time. An all-time record of 501-353 with a Stanley Cup in 2003 Burns is one of the most winning coaches in NHL history. He coached for Montreal, Toronto, Boston and New Jersey until he retired in 2005. I thought Burns was a lock this year and if his family has to wait one more year for Burns to get the recognition he so rightfully deserves, then there is a serious flaw in the induction process. He is only 16th on all-time regular season wins but is 6th in all-time playoff wins. He would have likely still be coaching today if his life wasn’t cut short at the age of 58. Hopefully we’ll see his picture hanging in the Hall next year.